In this paper, we deal with the valuation of Game Russian option with jumps, which is a contract that the seller and the buyer have both the rights to cancel and to exercise it at any time, respectively. This model can be formulated as a coupled optimal stopping problem. First, we discuss the pricing model with jumps when the stock pays dividends continuously. Secondly, we derive the value function of Game Russian options and investigate properties of optimal boundaries of the buyer. Finally, some numerical results are presented to demonstrate analytical properties of the value function. Russian option was introduced by Shepp and Shiryaev [1,2] and it was one of perpetual American lookback options. In Russian option, the buyer has the right to exercise it at any time. On the other hand, in Game Russian option, not only the buyer but also the seller has the right to cancel it at any time. This option is based on Game option introduced by Kifer . Game option frame work can be applied to various American-type options. Therefore, we apply this frame work to Russian option. The valuation of Game Russian option can be formulated as a coupled optimal stopping problem. See Cvitanic and Karatzas , Kifer . Kyprianou  derived the closed-form solution in the case where the dividend rate is zero. Suzuki and Sawaki  gave the pricing formula with positive dividend. Kou and Wang  presented the closed-form for the value function of perpetual American put options without dividend and so on. Suzuki and Sawaki  studied the pricing formula of Russian option for double exponential jump diffusion processes. In this paper, we deal with Game Russian options. Game Russian option is a contact that the seller and the buyer have the rights to cancel and to exercise it at any time, respectively. We present the pricing formula of Game Russian options for double exponential jump diffusion processes. 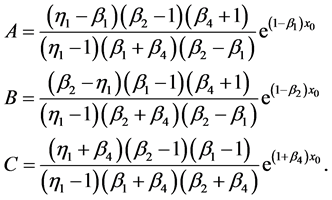 The pricing of such an option can be formulated as a coupled optimal stopping problem which is analyzed as Dynkin game. We derive the value function of Game Russian option and its optimal boundaries. Also some numerical results are presented to demonstrate analytical sensitivities of the value function with respect to parameters. This paper is organized as follows. In Section 2, we introduce a pricing model of Game Russian options by means of a coupled optimal stopping problem given by Kifer . Section 3 presents the value function of Game Russian options for double exponential jump diffusion processes. Section 4 presents numerical examples to verify analytical results. We end the paper with some concluding remarks and future work. By Girsanov’s theorem, is a Brownian motion with respect to . Remark 2.1 When the dividend rate , . where the supremum is taken for all stopping times . which provides the lower and the upper bounds for the value function of Game Russian option. The pair is the saddle point of . Remark 3.1 The seller minimizes the payoff function and . From this, it follows that the seller’s optimal cancellation region is . This means that is Lipschitz continuous and satisfies (4). If the penalty is large enough, the seller never cancels. It is of interest to show how much should be large for the seller never to cancel. Lemma 3.2 Set . If the penalty , the seller never cancels. In other words, Game Russian option is reduced to Russian option. , we have . Hence, it follows that because the inequality holds. In order to prove the above theorem, we need the following lemmas. 1) and , for . 2) It holds and satisfies for . 3) At we have . Then, is the value function of Game Russian options with dividend, i.e., holds. The optimal exercise region is the interval and the optimal cancellation region is . From (9) and (10), we have . That is, we obtain . Proof. The former assertion is known. We shall show the latter one. The second derivative of is nonnegative because and . It follows that is a convex function. Since is a convex function, is increasing. From this, we can see that for . By the boundary conditions and , we have . Then the equation has the unique solution in the interval . Since and , we have . Furthermore, it holds . Therefore, the equation has the unique solution in . In the rest of this section, we present some numerical examples to demonstrate theoretical results and some effects of parameters on the price of Game Russian option. We set . Using these parameters, is 0.248. Figure 1. Optimal boundary for the buyer. Figure 2. The value function. tes the value function of Game Russian option with jumps. Dashed lines represent the graph of the value in from the bottom, respectively. Real line represents the value in . From Figure 2, we can visually recognize that is convex and increasing in . In this paper, we discussed the valuation of Game Russian option written on dividend paying asset, obtained the value function of it for double exponential jump diffusion processes and also explored some analytical properties of the value function and the optimal boundaries for the seller and buyer, which were useful to provide an approximation of the finite lived Game Russian option. Moreover, we plan to examine convertible bonds with jumps by using Game option frame work. We shall leave it as future work. 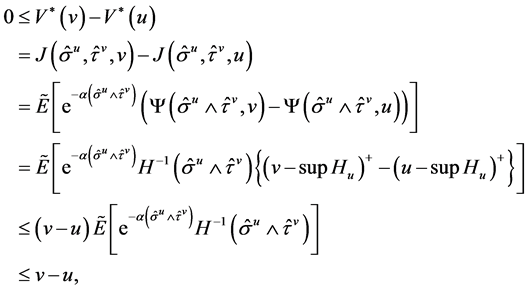 Suzuki, A. and Sawaki, K. (2010) The valuation of Russian options for double exponential jump diffusion processes. Asia Pacific Journal of Operational Research, 27, 227-242. Sato, K. and Suzuki, A. (2011) Stochastic cash management problem with double exponential jump diffusion processes. Lecture Notes in Operations Research, 14, 186-194.